Will an injection stop my bunion from hurting? The pain associated with a bunion on your foot is due to inflammation. That inflammation can be either at the bump on the side of your foot or deeper within the joint. Reducing the inflammation would help to control the bunion pain. A cortisone injection is very effective in reducing the pain from a bunion. Because the area of inflammation is so localized, an injection does a better job than taking an oral anti-inflammatory medication. Even so, the results of the injection are likely to be temporary. Over time, the inflammation will build up again and cause the pain to return. If you are experiencing bunion pain, the best time to get it checked and treated is now. Whether it be an injection, padding, custom orthotics, or even bunion surgery, Houston podiatrist Dr. Andrew Schneider will recommend the best and most effective treatment for you. Many people who have painful bunions on their feet struggle with shoes. The bump on the side of their foot at the great toe joint just takes too much pressure and becomes painful in their favorite shoes. The ideal shoe for someone with a painful bunion is one that has a wider forefoot and a narrower heel. Unfortunately a shoe like this is difficult to find. Some pads, like Dr. Jill's Gel Bunion cushions, are helpful in taking some of the pressure away, but for some it can just make the shoe tighter. The best shoes to wear with a bunion is simply the shoes that are most comfortable. A tennis shoe that is the widest you can comfortably keep on your foot or a dress shoe that doesn't provide too much pressure on your bunion may be your best bet. When you find that you have fewer and fewer shoe choices, it is time to consider surgery. If you find that you simply have no shoes that are fitting your bunion comfortably anymore, it is time to consider bunion surgery. Houston bunion surgeon Dr. Andrew Schneider will evaluate the bunions on your feet and recommend the best course of personalized treatment. Contact Tanglewood Foot Specialists for an immediate appointment. Many people who suffer with a bunion on one foot often have a bunion on their other foot too. Surgery to correct a bunion requires a significant investment in time. It makes sense, then, to have both feet operated on at the same time. While some doctors may agree with this convenience, I and many of my colleagues typically recommend against it. Bunion surgery requires a surgical fracture made in the bone. Although stable, this fracture can worsen with excess pressure. After surgery, we need to limit swelling by keeping your foot elevated. There is also a dressing on your foot that needs to stay clean and dry for several weeks after your surgery. While its relatively simple to care for one foot after surgery, it is exponentially more difficult to do the same for both feet at the same time. It is for this reason that I strongly recommend AGAINST doing both bunion surgeries at the same time. What sometimes happens is you end up with one excellent result and the other subpar? Wouldn't you rather two stellar results? If you are having pain from the bunions on your feet, don't wait to have them checked! Treating bunions early can dictate if you need surgery and how limited you will be suring your recovery. Contact Houston podiatrist Dr. Andrew Schneider for an immediate appointment. Can I drive after bunion surgery? Bunion surgery is a major surgery, although done on an outpatient basis. It involves sedation and general anesthesia. Because of that, you cannot drive on the day of surgery. In the rare case where one of my patients insists on local anesthesia only, with no sedation, I still don't allow them to leave the Houston outpatient surgery center on their own. After the day of your bunion surgery, driving depends on a number of factors. If your left foot was operated on, and you drive an automatic vehicle, then driving is not a problem. If bunion surgery was done on your right foot, or if your car has a clutch, then there is a safety issue. After a bunion on your foot is operated on, there will be a dressing on it and you will be wearing a stiff surgical shoe. This limits your driving in a couple of ways. First, you have to be concerned about your surgery and the investment you are making in your recovery. Think about it....if you are forced to slam on your brakes, the area of your bunion surgery can be injured. This can extend your recovery and even require another emergency surgery to correct. The second issue is the safety of driving. When you have a extensive gauze dressing on your foot and wearing an inflexible shoe, you lose the mobility and sensitivity to drive safely. At Tanglewood Foot Specialists in Houston, TX, we are committed to solving your bunion pain, whether with or without foot surgery. We also need to make sure you stay safe to make sure you are able to fully enjoy life without pain from the bunion on your foot. Will my bunion come back after surgery? The goal of bunion surgery is to reposition the metatarsal bone and eliminate the bump on the side of your foot. The foot surgery addresses the effect of unstable mechanics that caused the bunion to form in the first place. 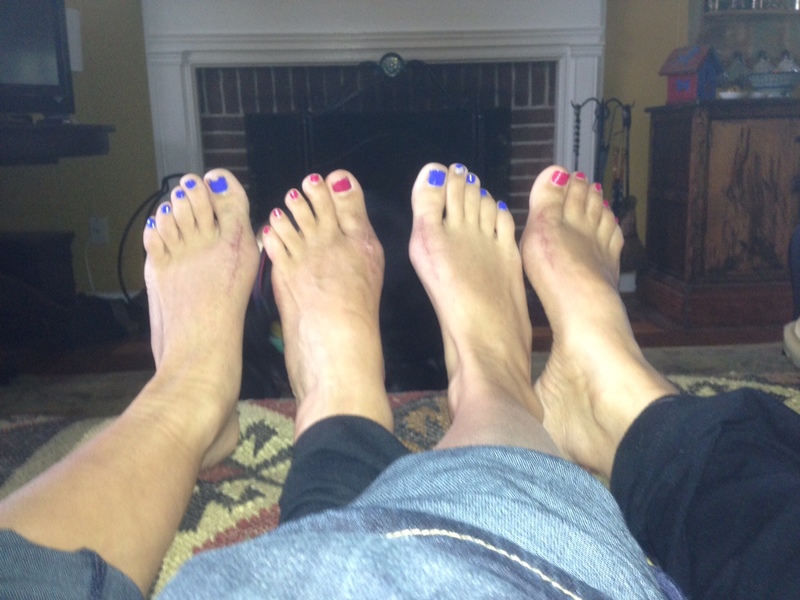 This mechanics is usually hereditary...one of your parents or grandparents probably have bunions. You have them to thank! Bunion surgery deals with the effect of your hereditary built-in mechanics. The way your foot functions is what created your bunion. By repositioning the bone that forms the bunion, you just restart the clock. If nothing further is done after surgery, your mechanics will take over and your bunion can come back. After surgery, it is essential to focus on controlling the mechanics that formed your bunion. This control is achieved with a custom foot orthotic. An orthotic will balance your feet and ankles to neutralize your mechanics and prevent your bunions from returning. If you had bunion surgery and are worried that your bunions may return, do not wait!! Houston podiatrist Dr. Andrew Schneider will evaluate your mechanics and prescribe the custom shoe insole that will get your feet feeling the best, provide you stability and efficiency, and prevent those bunions from returning. There is no "one size fits all" bunion surgery. This is because a mild bunion will require a different procedure than a severe bunion deformity will. As such, there is different procedures that can be performed to correct a bunion on your feet. Some bunion surgery procedures are stable, such as the ones performed for a mild and moderate bunion. The stability of a procedure is largely due to the part of the foot being operated on, the type of procedure, and the type and stability of the fixation used. Because of the good stability, we don't need to add additional stability and protection from a cast. With more severe bunions, the procedure itself is less stable. In order for it to successfully heal, we need to offer protection. It is in these situations where you will be in a cast after surgery. Mild and moderate bunions on your feet do become severe over time. Having your bunions evaluated and treated sooner will result in more conservative options and, when surgery is your best option, a more straightforward recovery. Contact Houston podiatrist Dr. Andrew Schneider to have your bunions evaluated and the best course of treatment recommended. Bunion pads are designed to cushion the pressure of the bump on the side of your great toe joint against a shoe. There are many types of bunion pads available in the pharmacy foot care aisle, in catalogs, and online. All are designed to cushion the bunion against the side of shoes. There are a variety of materials used to make bunion cushions. These include gel, foam, and felt. Some use an adhesive to stay on, others do not The pad that works best for my patients is a gel bunion cushion that uses a soft loop around the great toe. Bunion cushions do not provide relief for everyone, but for those that find relief it helps to delay treatment with bunion surgery. If you have a painful bunion on your feet, contact Dr. Andrew Schneider for a comprehensive evaluation and recommendation for the best treatment for your condition. Can I wear high heels after bunion surgery? One of the biggest concerns of women who have bunions on their feet and are considering bunion surgery is whether you will be able to wear high heels again after surgery. In most cases the answer is yes...and much more comfortably than before surgery! The realignment of the great toe joint will allow for greater motion and the position that a high heel forces you into will no longer cause the joint to jam. There are cases, however, where the joint may have degenerated to the point where, even after surgery, there will continue to be limited mobility around the joint. There are also some procedures that may stiffen the great toe joint and limit mobility by design. These situations will limit the shoes and heel heights that may be comfortable for you. Since every person, bunion, and foot surgery is different, it is important that you ask your Houston bunion surgeon what to expect after your surgery. Houston podiatrist Dr. Andrew Schneider will review your case in detail and let you know what to expect after your surgery. Contact Tanglewood Foot Specialists to schedule an appointment to see what will be the best treatment option for you.